Two things struck us immediately when we first saw this unit. First, this juicer is very compact. 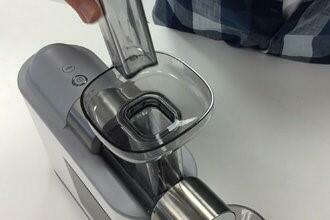 Measuring only 11mm wide, it takes up much less counter space than typical horizontal juicers. Second, the minimalistic design has a very premium feel to it, thanks to the high-quality plastics used and especially the solid metal locking collar. Unlike any horizontal juicer we’ve ever tested, where the auger turns away from the motor and the pulp is ejected at the far end, the auger on this machine actually turns toward the motor, and the pulp is ejected into an integrated pulp catcher that again gives this machine such a streamlined look. Another first is the complete lack of any metal juicing screen. Instead, it uses two small plastic “crowns” that snap together, forming a cylindrical filter. This juicer is designed to be fast and easy to use, and for the most part it meets those goals. However, this may come at a cost. Unlike most horizontal juicers, which operate at a 70-80 rpm speed, it doesn’t list its speed anywhere in the manual or on its website. So we tested the speed and found it runs at approximately 300 rpm! It allowed for fast juicing, but like centrifugal juicers it also produced a lot of foam. The manufacturer claims a 1-minute cleaning time, and after we got the hang of disassembling the unit, it was mostly true. Since there is no metal juicing screen to brush, most produce bits washed away under running water. However we recommend using a sponge with harder-to-clean produce. The compact design does have one significant drawback: the feeding tube is the smallest we’ve ever seen on a horizontal, meaning that produce has to be cut into very small pieces and the device does tend to back up due to the small juicing space and relatively high rpm. Oranges: Most juicers handle oranges well, and this juicer was no exception. It made 320 ml from 500 g of peeled oranges. The juice quality was fine, if a bit pulpy. 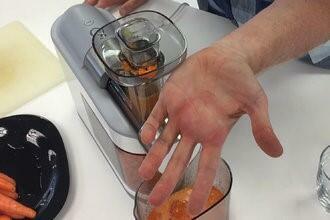 Carrots: Carrots are a natural fit for horizontal juicers, but we were unpleasantly surprised by the results here. The small auger only takes small “bites” off the carrots, and the carrots had to be cut lengthwise to fit into the tiny feeding tube. Also, similar to a twin-auger juicer, a lot of force was needed to feed the carrots, and the poorly-designed pusher didn’t help. It is hollow, and the top is open like the rim of a box, which made it painful to use when you must push so hard. We solved this by stuffing the top with paper towels to create a softer surface. Surprisingly, we had problems with the carrots backing up, probably due to the small size of the auger housing and wet pulp getting stuck in outlet. Fortunately it has a handy “reverse” button to clear things up. The resulting juice was less intense and more watery than from a typical horizontal juicer. 1 kilo of carrots yielded 400 ml of juice, which is about typical. Apples: Unlike the carrots, the apples juiced quickly and easily. We used a standard circular apple slicer that cuts it into eight pieces, and they were a perfect fit. Similar to a centrifugal juicer, the high speed produced a lot of foam. One kilo of apples made 650 ml. of clear, watery juice and 200 ml. of thick foam. The taste was light and crisp, not as dark and intense as from a slower juicer. Pineapple: After our bad experience with apples, we were afraid to see how the pineapple would do, since pineapples are a major culprit in clogged juicers. Thankfully our concerns were unfounded. It juiced the pineapple effortlessly. A 500g pineapple yielded 320 ml of tasty, slightly pulp juice. Spinach: The manufacturer’s website states that this model can be used to juice spinach, so we were curious to see the result, since high-speeds are usually ineffective with greens. As it turned out, our hunch was right. We juiced 200 grams (which is more than it sounds) of baby spinach leaves, and this machine created a thick dense foam, with a tiny bit (approx. 40ml.) of juice at the bottom. Overall, this juicer is a mixed bag. Made in China, it feels solid and looks great. It operates fast, and is very easy to clean. However, the compact design creates performance limitations and the lack of juicing screen creates watery, pulpy juice. The plastic filter is fragile, and one of the pins on it bent after a few uses. If you plan to juice things like oranges, pineapples, and soft fruits, it is an attractive option. If you want to juice leafy greens and root vegetables, we recommend a true slow-speed horizontal juicer. Also, the two-year warranty is pretty skimpy compared to the 10+ years offered on competing models. We give it 3 stars out of 5.